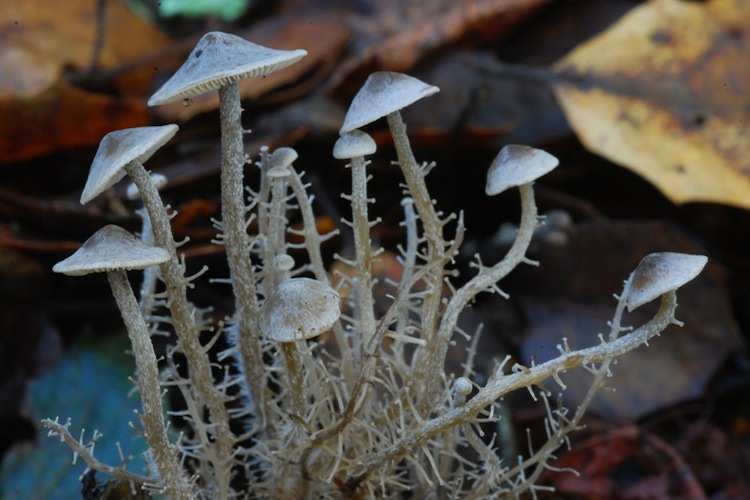 Dendrocollybia are some of the most unusual and fascinating mushrooms in the world (honestly, that's not hyperbole). Long thought to be monotypic, our recent discovery of an undescribed taxon from Santa Cruz expanded the number of species in the genus to two. However, given that the European populations, extremely rare eastern North American population, and western North American populations are disjunct, we consider it likely that there are multiple taxa going by the same name. Occupying a rather odd niche, Dendrocollybia fruit off of the decaying remains of Lactarius and Russula, but do not actually parasitize the fruitbodies of their host (ie. colonization and digestion only occurs after the host fruitbody has stopped releasing spores). Identification is straightforward (given our current understanding of the two species in our area), based on size and shape of conidial pegs as well as size and shape of the sclerotia (which may be embedded in host tissue or hidden in duff).